Coeur Mining (“Coeur” or the “Company”) is a well-diversified, growing precious metals producer with five mines in the Americas including the Palmarejo silver-gold complex in Mexico, the Rochester silver-gold mine in Nevada, the Kensington gold mine in Alaska, the Wharf gold mine in South Dakota, and the San Bartolomé silver mine in Bolivia. The Company also has a non-operating interest in the Endeavor mine in Australia as well as a royalty interest in Ecuador. In addition, the Company has two silver-gold exploration stage projects – La Preciosa project in Mexico and the Joaquin project in Argentina – and conducts ongoing exploration activities in Alaska, Nevada, South Dakota and Mexico. Dr. Allen Alper:	This is Dr. Allen Alper, Editor-in-chief of Metals News, interviewing Mitch Krebs, President and CEO of Coeur Mining. Could you tell me a bit about the focus of your company, your plans and what differentiates Coeur from its peers? Mr. Mitch Krebs:	Coeur is a well-diversified, growing gold and silver mining company with a rich history dating back to 1928. 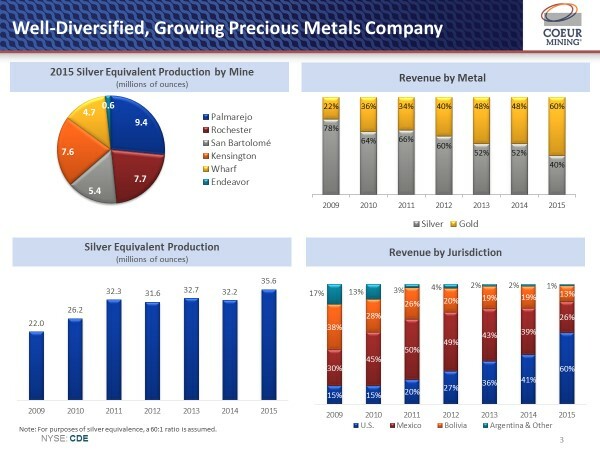 While about 60% of our revenues come from gold and 40% from silver, we are perhaps best known as being the largest U.S. based primary silver producer. Just seven years ago, our revenue mix was very different with 80% of our revenues derived from silver and 20% derived from gold. The growth in our Company since then has largely been on the gold side, most notably with our acquisition of the Wharf gold mine in South Dakota in early 2015. This year we expect to produce about 15 million ounces of silver and about 340,000 ounces of gold from five operating mines. In addition to our Wharf gold mine in South Dakota, we own the Kensington gold mine in Alaska, the Rochester silver-gold mine in Nevada, the Palmarejo silver-gold mine complex in Mexico and the San Bartolome silver mine in Bolivia. Our Rochester mine is Nevada's largest silver mine, and our largest operation is the Palmarejo mine complex. The geographic diversity of our mine portfolio is the result of our strategy to grow our business in the U.S. and Mexico, thereby reducing our exposure to Bolivia. As mentioned earlier, we also have a more balanced mix between silver and gold than we did years ago. 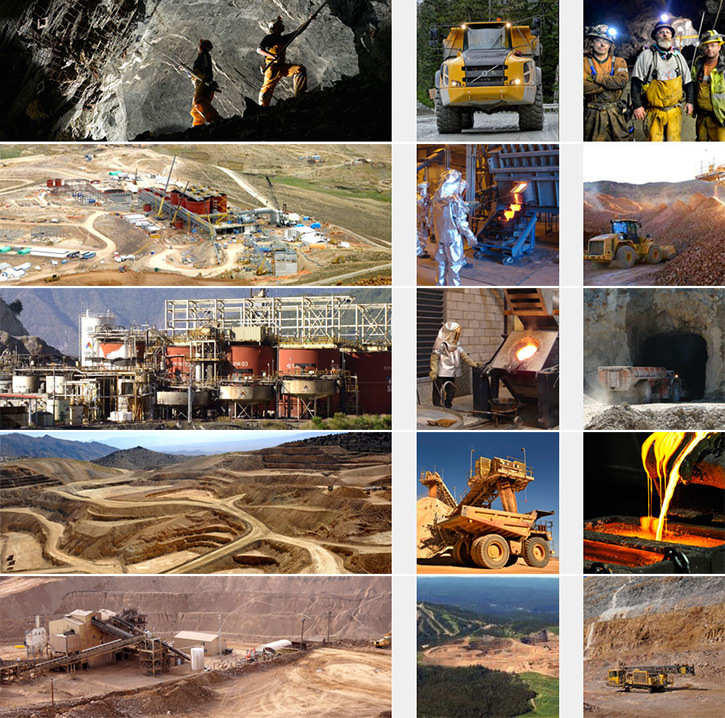 Portfolio diversification is important in our industry as it helps to offset some of the inherent risks of being a mining company. Another area of strategic focus has been around operational discipline and cost reductions. We have demonstrated industry-leading cost reductions of approximately 30% over the last three years, which is particularly remarkable given the limited amount of foreign exchange tailwinds that we enjoy relative to our peers. 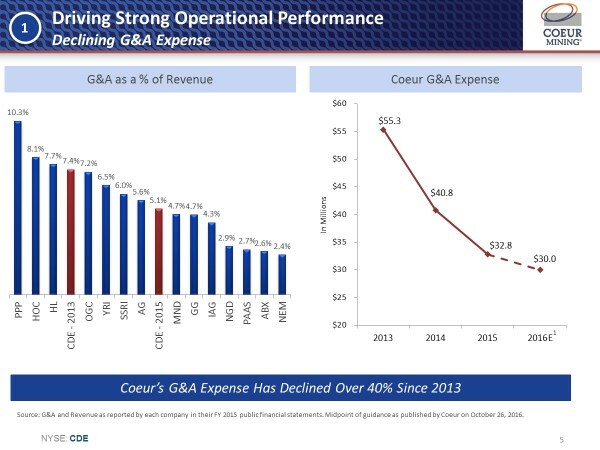 We have instilled the same discipline on the non-operating side of the business as well with our G&A costs declining by about 45% over the last three years. This was driven by an organizational overhaul that we initiated shortly after I was named CEO in 2011. We basically have a new management team, and in fact, 90% of our employees at the mine management level and higher joined the Company within the past four years. About half of our board of directors is also relatively new, so it's been a fresh start for us. Through these organizational changes, we have created a culture where we hold ourselves to a higher standard. This culture and drive is demonstrated through our strong operational performance and improving cash flow profile. And I think we've now set ourselves up for a very good run, whether the prices continue to go up or stay where they are. Dr. Allen Alper:	That's great. Excellent performance, reducing your costs like that! Really something to be very, very proud of! Mr. Mitch Krebs:	Yes, and I appreciate you saying that. When you have three of your five mines in the US, like we do, and a fourth mine in a country whose currency is pegged to the U.S. dollar, hardly any of that cost reduction is coming from the foreign exchange tailwinds that many of our peers are experiencing. 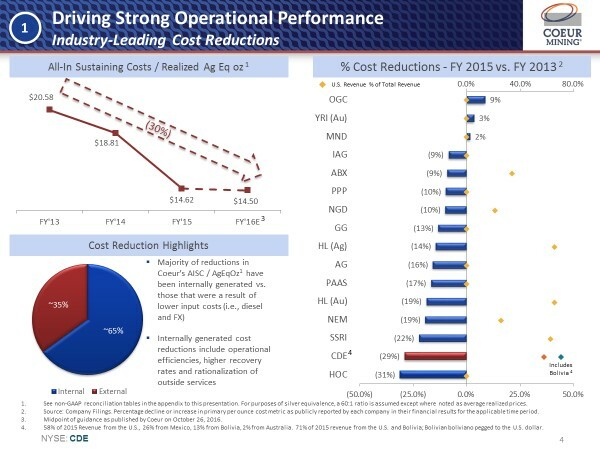 Our cost reductions have and continue to be driven by the real hard dollar savings that we're generating through efficiencies, larger scale mining, and higher grade mining. So we're very, very proud of this performance. Dr. Allen Alper:	That's excellent! Could you tell me a bit about your reserves and resources? Mr. Mitch Krebs:	We have a large reserve base with mine lives ranging from three to ten years. I think it’s important to note that underground mines, like our Kensington mine in Alaska, which has a three-year mine-life based on reserves, typically have chronically short mine lives due to the relatively higher cost of definition drilling. We recently published an exploration update that shows the positive results we've had drilling around our existing mines. This is important because our mines have been under-drilled over the last several years and really since most of these mines were put into production. We now have the budget to accelerate our exploration efforts. Drilling around our existing mine sites has the added advantage of a higher probable success rate and a quicker opportunity for payback. 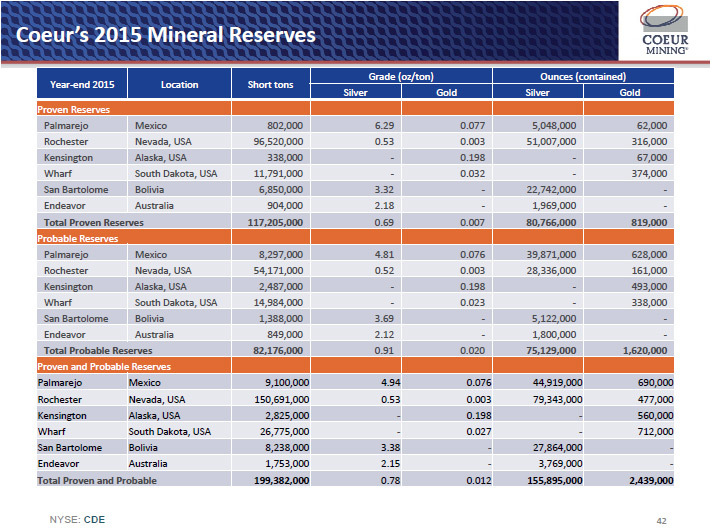 Our total 2015 silver equivalent resources exclusive of reserves were just over 400 million ounces, plus approximately 120 million ounces of inferred resources. While the goal of conversion drilling is to increase reserves, our priority is to improve the quality of our reserves by targeting higher grade mineralization. 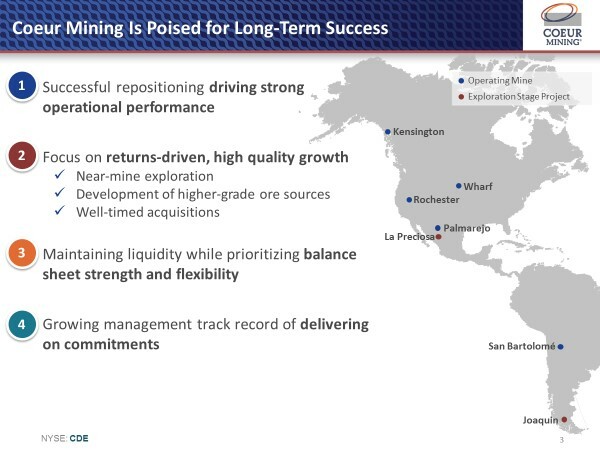 We redesigned our exploration programs and incentive plans a few years ago to target not only these near-mine, higher grade resources, but also a higher level of integration between our exploration and operations teams to make sure the two are very closely coordinating around those existing mines. These changes have started to really pay off. We've had some new, high grade discoveries at a couple of our mines that we believe have the potential to enhance the economics of those operations once we are able to begin mining that higher grade material. Exploration and reserves, particularly the quality of those reserves, is a real focus for our company. Dr. Allen Alper:	Sounds excellent! Could you tell me a bit about yourself and your team? I know you have an excellent financial background, went to the best schools probably in the world. Could you tell me more about yourself, your team and your board? Mr. Mitch Krebs:	I grew up on a farm in rural Iowa, corn and soybeans, so I guess commodities are in my blood. My first professional experience was in the investment banking industry in New York City where I ended up working on a few different projects for Coeur, which at the time was based in Coeur d'Alene, Idaho and had mostly US operations. I ended up joining the Company in 1995 and have remained here ever since apart from my two years at Harvard where I earned my MBA. While my responsibilities grew over the years, it wasn’t until I was named CEO in 2011 that I was in a position to start effecting fundamental changes to the management of our Company. So to give Coeur a fresh start with a new corporate team, we decided to move our headquarters here to Chicago in 2013. This ended up being a major catalyst to our business and gave us access to a much deeper pool of talent. In terms of the management team, our chief operating officer is a gentleman that has about 30 years of experience. Most of that was with Newmont Mining in a variety of capacities. Our chief financial officer, Peter Mitchell, has an interesting background. He came from a copper mining company based in Vancouver, and he also has some experience in private equity, which has been very useful in the areas of balance sheet optimization, capital markets activities and capital allocation. He brings a real discipline to that part of our business, which is something this industry has lacked for many years. Our general counsel came from outside of mining, which has brought some great perspective. Our head of exploration, Hans Rasmussen, who has worked both at the Newmonts and Rio Tintos of the world, as well as in the junior exploration sector, which has given him extensive, diversified experience. Our board is a group of highly accomplished individuals with experience in a number of different capital-intensive, cyclical industries, including coal, oil and gas and even housing. Several of our board members are very seasoned and have served on our board for a long time. We have also had a real influx of fresh experience and perspectives with a number of new directors. Combined, it's given us a diverse and balanced set of directors to be able to leverage, for their expertise and guidance. It has been a great upgrade! We are very fortunate. Dr. Allen Alper:	It sounds excellent. A very well balanced, excellent board. Could you tell me a bit more about some financial highlights, operating highlights of the company? Mr. Mitch Krebs:	I mentioned the costs. I mentioned the G&A reductions. Historically, this company has had a challenged balanced sheet that has introduced an additional layer of risk to the overall business. Over the last 12 to 18 months, two things have happened relating to our balance sheet. 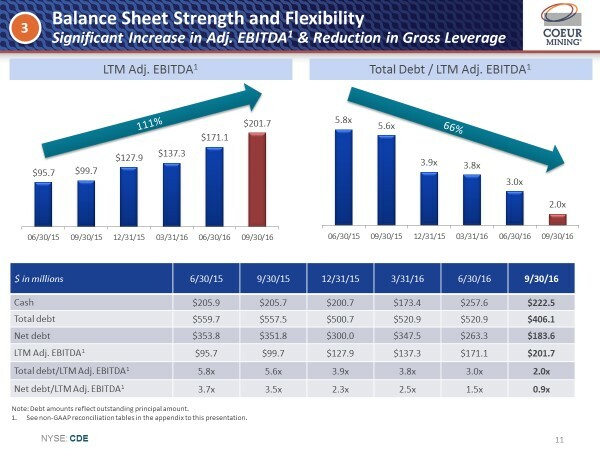 We have been very proactive in reducing financial leverage. We took on some debt between 2013 and 2015 to help fund initiatives that were necessary to drive down costs and accelerate growth as well as make some acquisitions that have improved the quality of the company. But we have a philosophy that in a capital-intensive, cyclical business like mining, a conservative balance sheet is prudent. Debt has served us well, but now it's time for it to go. The investments that we were able to fund with our debt proceeds are now paying off in the form of growing EBITDA and free cash flow generation. Cash flow is growing due to cost reductions and recent acquisitions, and our debt levels have been coming down, resulting in our overall balance sheet leverage statistics going from some of the highest in the industry to the lower half of the sector, and continuing to decline. Our all-in sustaining cost per silver equivalent ounce is now running in the $14 an ounce range. Three years ago, it was about $20 an ounce. These cost reductions combined with the year-to-date pick-up in gold and silver prices have resulted in a transition to positive free cash flow starting in the second quarter of this year. We expect our free cash flow to continuing growing throughout the balance of this year and into 2017 and beyond. I think that's a really big milestone and a real differentiator, in terms of companies that can actually generate free cash flow in the current price environment, or even at lower prices, and those that can't. We're very pleased to have made that transition here at Coeur Mining. Dr. Allen Alper:	That's excellent performance. That's something! A great accomplishment! Dr. Allen Alper:	Could you tell me a bit about your view, and others, on the outlook for the silver market? Mr. Mitch Krebs:	As you know, silver is a unique market. It has a lot of the characteristics of gold, in terms of being a safe haven or a hedge against monetary and financial risk that people perceive around the world. But what is different about silver is that over half of the demand is industrial demand with true consumption, which has been a little weaker due to lower global economic growth. I think there are some new growth markets for silver that make it very interesting - things like solar panels and photovoltaic demand. A decade ago, the amount of silver that went into solar panels was something like 5 or 6 million ounces in a year. Last year, it was something like 70 million ounces. That continues to grow as new photovoltaic capacity is installed in places like the U.S., China, India and Europe. And I believe that will be a real growth market for silver as solar demand continues to grow worldwide. Even in automobile sales, there’s about ¾ of an ounce of silver in each new automobile for all the electronics that go into new cars these days. As global auto sales continue to grow, I think that will be a continued source of growth for silver demand. On the supply side, everything that I've seen points to a reduction in total supply over the next several years as a result of a lack of exploration investment over the last few years as well as a lack of capital investment into new silver mines. A lot of the silver that is mined globally is a byproduct from copper mines, lead mines and zinc mines. Slower global economic growth has put downward pressure on demand for things like copper, which has a spillover effect into byproduct silver production. These factors are all supportive for silver, and I believe prices have the potential to really take off given how small a market it is. Dr. Allen Alper:	Well, I appreciate your insights into the market, and I know our readers will too. Thank you for that excellent summary. What are the primary reasons our high-net-worth readers/investors should consider investing in your company? Mr. Mitch Krebs:	Generally speaking, I think having some precious metals exposure in anybody's portfolio is prudent, especially in the kind of world we live in today. And I believe that we have one of the most compelling, if not the most compelling story in our space. We have demonstrated strong operating discipline and performance, we offer a diversified and balanced asset portfolio both by metal and jurisdiction, and importantly, we offer exposure to a growing cash flow profile. 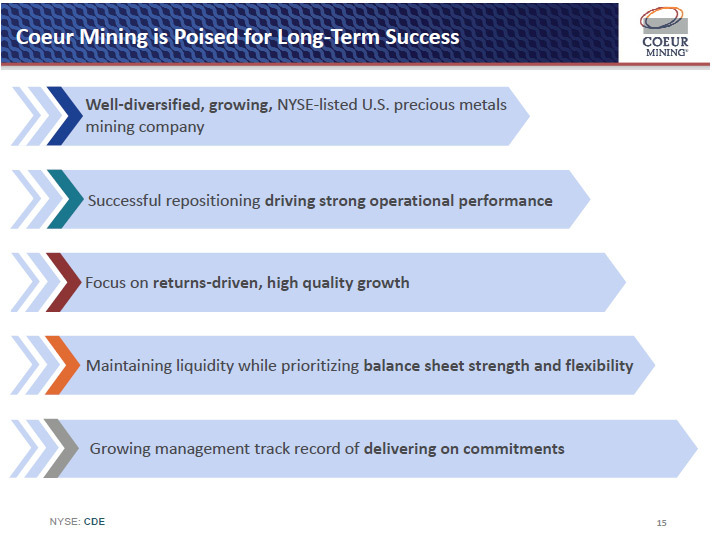 Dr. Allen Alper:	Those sound like excellent reasons why our high-net-worth readers/investors, should consider investing in Coeur Mining. Is there anything you'd like to add? Mr. Mitch Krebs:	We'll continue to look for new ways to improve the business, whether that's through more early stage exploration or selective acquisitions. What we want to continue to do is be a relevant, well-regarded, disciplined precious metals mining company that investors can buy and own and trust that management will make good decisions. I think that we're starting to build that track record. I'm very pleased with how we're doing so far and I'm enthusiastic about where we are going.